We are finally home this weekend and I plan to get some quality clean-home-photographing and overdue cooking time in for next week’s posts. Now that the baseboard painting project is on hold in the master until I can figure out what wainscoting I want to do (advice still greatly appreciated!) our weekend is free to relax and get the house back in order, maybe some spring yard sprucing if we motivate ourselves…maybe. Our master bath update is about 60% done. All that is left is replacing the countertop, installing the new sink and faucet, and upgrading the louvered bi-fold closet doors. 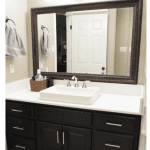 We have painted, installed a new light and mirror, and stained the cabinetry. 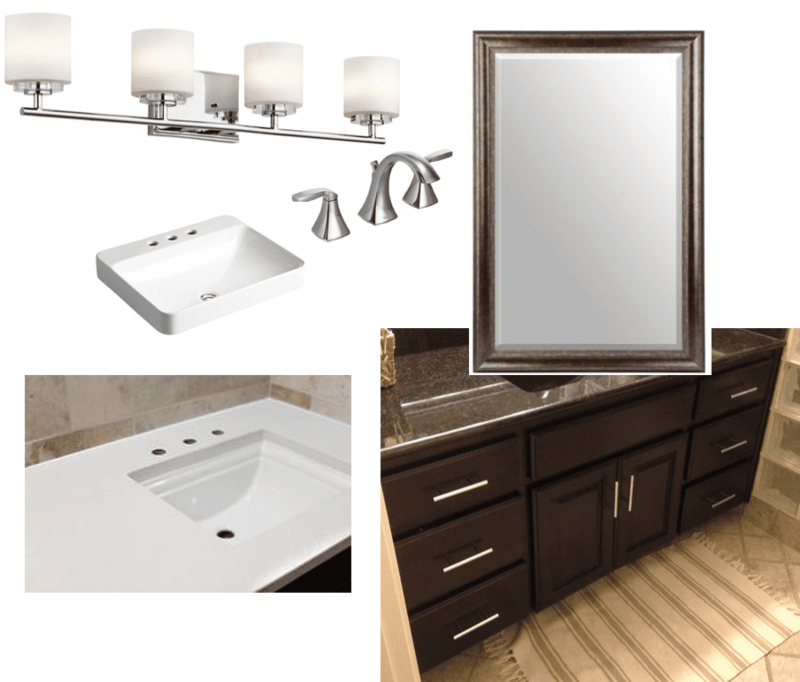 I hate being at a stand still on a project but the next step, the countertop, is a big cost and needed to be saved up for. Buuuut, sweet husband said we can use some of our tax return on it and it was ordered today!! 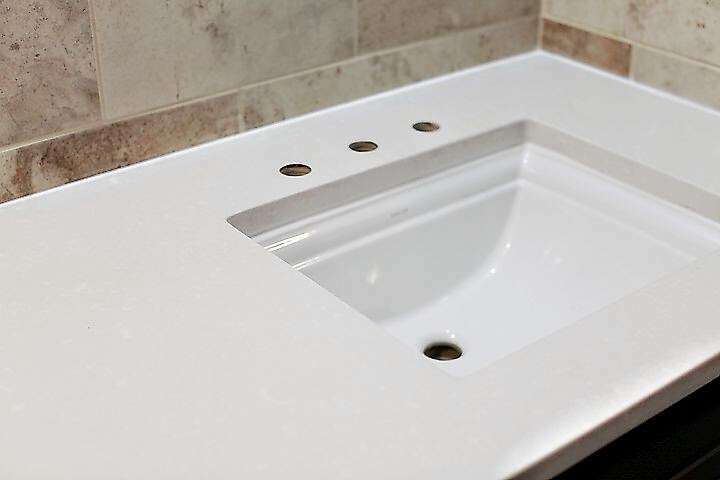 I knew I wanted to do quartz again and have decided on doing a clean, sharp white to contrast with the dark cabinetry and to counteract the business of the glass blocks of the shower and the smaller stone tile on the floor (I wish they were larger). I’m not a granite fan at all unless it is really dark like in our kitchen (and currently in here), or really light. I can’t stand all the busy, blotchy patterns and think it looks like vomit in my opinion. Vomit granite is very prevalent in this area and it makes me want to scream. I would take laminate over vomit granite. I digress. 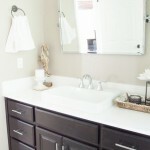 Countertop shopping is pretty much my favorite thing ever and this bathroom remodel may or may not have been secretly driven by my desire to shop for countertops again :) I was familiar with alot of the whites from the guest bathroom counter shopping but went to our Home Depot to get a more focused look at them. We are using them again because they are the only big box here that will do a small square footage (Lowe’s has a minimum of 25 square feet, we have 10), it was such an easy and quick process before, they have 10% off sales frequently, and small stores in this area don’t have much quartz, just alot of vomit granite to choose from. But look at it under our lighting above, it’s wayyyy more cream. 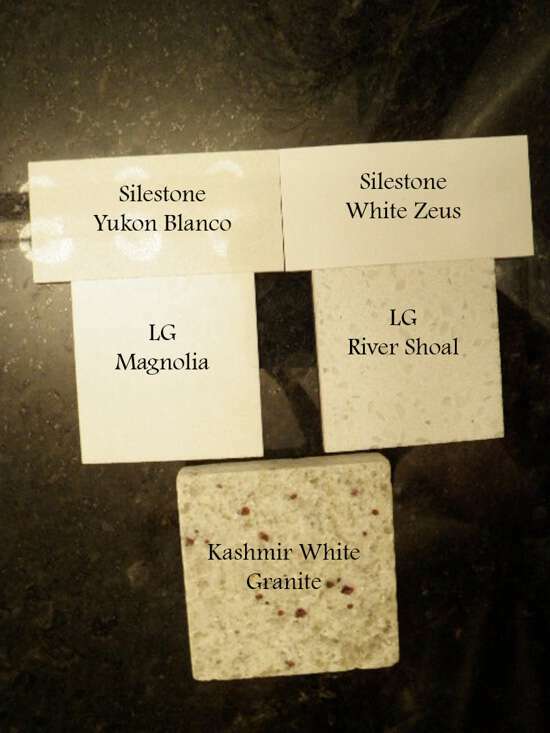 LG’s Magnolia then became my front runner but I just kept thinking of Silestone White Zeus. HD didn’t have it on their board and their online countertop estimator didn’t show it so I thought it wasn’t available, like the unattainable dreamy guy from high school, and I accepted it wasn’t meant to be just like I did back then. But, I thought I’d go by and just ask so that I would have the assurance that I looked at all my options, and come to find out yes, it is offered, yes he had a secret sample stash, yes they are 10% off right now, AND it is $20/sqft cheaper than LG Magnolia! My dreamy White Zeus could be mine! Probably THE BEST feeling in DIY is the unexpected score of the perfect thing along with a money saver!Just look at this clean gorgeousness! 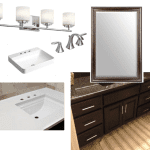 My Zeus was $38/square foot so our single-cutout with 4″ backsplashes, removal of our old countertop (which we plan to Craigslist) and installation came to $630.59 with the 10% discount, about $225 less than the LG Magnolia would have been at $58/square foot!